O Canada! Let the Games begin! The Opening Ceremony at each edition of the Olympic Games is a much-anticipated event as the world waits to see how the host city will launch the most prestigious sporting extravaganza on Earth. The city of Vancouver more than rose to the occasion with a spectacular display of choreography, lights and special effects and a roster of Canadian entertainment legends. It was the first time in the history of the Olympic Games that an Opening Ceremony had taken place indoors. More than 55,000 spectators filled the B. C. Place Stadium, which has the largest air-supported dome in North America. The ceremony featured a dazzling array of Canada’s best-known musicians and entertainers including Bryan Adams, Nellie Furtado, Sarah McLachlan and k.d. lang. Also featured were representatives from Canada’s indigenous Four Host First Nations who welcomed the world to the Games in English, French and their own languages.. There was a somber moment when the Georgian team entered the stadium during the parade of athletes. Earlier in the day, their teammate Nodar Kumaritashvili died following a crash during a training run for the men’s luge singles. The spectators cheered loudly for the team and later, observed a minute of silence in Kumaritashvili’s memory. The Canadian team entered the stadium to a tumultuous ovation, led by flagbearer Clara Hughes, who is the only athlete from her country to medal in both the Winter and Summer Olympic Games. A former cyclist, she is the only athlete in history to win multiple medals at both Games. After much speculation about who would be the final torch carrier and light the Olympic cauldron, Canadian hockey great Wayne Gretzky had a hand in lighting two – the first was in the stadium where he was joined by Paralympian Rick Hansen, speed skater Catriona LeMay Doan, NBA star Steve Nash and skier Nancy Greene. Gretzky then carried the official flame outside and hopped into a pickup truck which carried him to an outdoor display near the city center, where he lit a similar cauldron to the one indoors. Fireworks erupted outside the arena and elsewhere in the city, bringing the ceremony to a close. 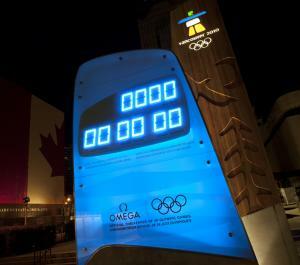 OMEGA is serving in its capacity as Official Olympic Timekeeper for the 24th time since 1932. At the Vancouver 2010 Olympic Winter Games, the brand has deployed a team of 235 timekeeping and data handling professionals who are supported by 290 trained local volunteers. The 250 tons of equipment they brought from Switzerland will be used to time the results of every event at the Games.